In our last two blog posts, our colleague, Tyler Morrison has spoken about why an engagement survey is important to understanding your organization's health and how to prepare your organization for your survey. This week Tiffany Adams, is taking the reins and sharing her ideas for not wasting all the money you just spent on your engagement survey! Congratulations, you’ve executed a well-run engagement survey. Now what? The next step is the most intimidating to think about, but the most important. You have already gone to the doctor and had the tests run. Based on those results, your doctor should come back with a set of options for you. The choice of what to do with those options is entirely in your hands. Is your goal to be more fit, eat a better diet, start an exercise plan, or will vitamins be in your future? Of course, doing nothing is also a choice but the next time you go back the odds of you achieving that goal or improving your health is low. Chances are, your health will either stay the same or wane. When I was a young, my Grandad had a massive heart attack. It was a miracle that he survived, and there were immediate changes in our family, no more salt or fried foods. It has shaped how I cook, how food tastes, how important exercise is… all from a single event more than 25 years ago. We took the doctor’s advice, did something with it, and changed our entire family’s outcome. How does this relate to engagement surveys? 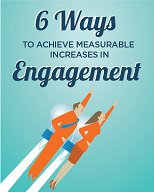 You have invested in an engagement survey and understand the health of your organization, and now comes the hard fun part, the opportunity to change your work family’s outcome. 1. Believe what your employees say. It matters and leadership must engage in change. – Beginning with the right state of mind and communication is critical. I have heard too many executives say, “We know things are bad, we don’t need to hear it.” Big changes may have happened in the organization and leadership is nervous to hear what their employees are saying. For the life of me, I don’t understand this thought process. In a relationship, if your partner/friend is upset, do you say to them, “I get it. You’re upset, but I don’t need to hear about it.”? Prepare yourself for damage control if that’s how you handle it. The same can be said for the work environment. Trust takes time to build, and for many, it’s hard to speak up. However, when employees do, thanking them can have a significant impact. 2. To truly understand the results of your survey…. LISTEN. One of my favorite leadership experts, Ken Blanchard, says, “God gave us two ears and one mouth because he wanted us to listen more than we talk.” Seek to understand the “Why” of the answers on your survey before you act. Survey data is a means to facilitate focused conversations with employees. Before you rush forward with a plan, set up some focus groups and have some discussions. Gain further perspective on your results. This will help set the tone on an organizational level and later help empower ownership at a local level. 3. Decide to do something. Even better, two somethings. When it comes to prioritizing action plans, don’t feel like you must boil the ocean. In fact, that’s an awful idea. Decide change will happen by putting a focus on one or two items you know you can impact. A good survey provider will give you suggestions as to what ideas there are to focus on that WILL help drive results. You can’t cut out soda, switch to all organic meats, fruits, and vegetables AND train for a full marathon in three months. You should just start somewhere so that you can be consistent without burnout. It’s the same with making positive changes within the organization. By choosing one or two things to act on you’ll be able to show employees change is happening as you tackle the opportunities and communicate your focus. 5. Accountability. Do it. It is hard to take a stand and announce that you are going to do something. It is mostly because then people expect that you are going to do it. Accountability is hard, and exactly what an organization needs. 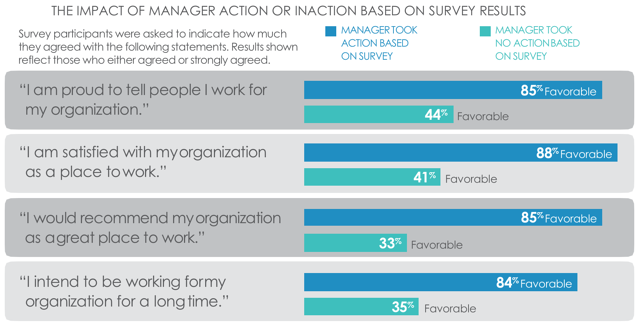 Only 62% of respondents to our survey said their managers acted on results. Check out the difference when those managers DID (below). They may or may not have been 100% successful, but they did something in response to what their employees said because it matters to them. It made a huge difference. BONUS: Focus on the good. When the organization is doing something well, tell your people that. Success in any form is worth sharing. The fact that you and the organization care enough to ask your team how to get better, tells me something is going right. Engaging with your doctors isn’t always about treating sickness, it’s also about optimizing wellness. So now that you have done all the hard work treat yourself to the dairy-free, soy-free, gluten-free ice cream cone. I’m kidding! Sometimes you just need to go for the double scoop of butter brickle, because life is worthy of a celebration. Tiffany Adams is the VP of Business Development at Engage2Excel. Having spent more than twelve years in the Human Capital space, she focuses on her clients’ ability to show measurable results and impact to their organization. She’s a firm believer in Servant Leadership and its role in engaging employees. Follow her on LinkedIn and Twitter.